I've been trying to teach like an artist more lately and I'm learning a lot from the approach. I can hardly walk through the hall at the middle school now without a student asking when we can work on their next creative project. They are inspired to create music and videos. It's been an exciting year so far. One thing I'm seeing is the value, I'd even say the blessing, of just being OK at the art I share. I've been frustrated at the mediocrity of most songs, games and other creative works I've made in my life. Now I'm opening my eyes to the gift as I see it helps me encourage others. I have learned the value of hard work over a long time when it comes to following a dream. I think great talent might make tempting to amaze the average person with something that was easy. For me, the desire to make a great song or popular game has been beyond my reach, but I got closer by keeping at it longer than most people I know. Students need to hear of that as they learn to follow dreams. Similarly, I've learned what it's like to push through the fear of failure. I know I'm not a great musician or graphic artist, but I've taken the plunge a few times and put my best effort out there. Every young artist has to deal with that possibility of rejection. Being barely acceptable myself, even after years, provides me with tips as well as examples of failures that I lived through. I can to draw on those to encourage students. My mediocre creations seem attainable to students. They are willing to try. If my sketched cartoons were amazing maybe they'd never imagine they could do it too. Instead, I've seen many students take a shot at similar sketches when they see me draw simple figures. I can speak to the joy that comes from sharing an idea. Many artists talk about the pleasure of blessing others with their work. I believe them, but doesn't it seem easy for them to say that when they make a comfortable living from it at the same time? I can say with certainty that seeing my creations as a gift for others is a great reward. Sometimes I wouldn't make time for creating art for any other reason. Being just OK at many things gives me the chance to help more people as they pursue their interests. I think if I had been more disciplined 25 years ago I might have excelled in one area. Instead I spread myself thin. Now that helps a lot in my job where I have to help in every class from Digital Photography to Creative Writing to Choir. I would never suggest to young artists that they so divide their time, but if you also find yourself average at many things, start doing each of them a little more often in class. Being OK with sharing OK art is helping me be better. This is huge. Getting a taste of the joy of self-expression will inspire you keep at it and you'll get better. Probably more importantly, though, it gives you a chance to show your students what a learning, growing adult looks like. They will be inspired to do the same in their areas of interest. Lest it sound like I'm lowering the standard, I do make sure the students know I'm not a great artist. Even if the low number of hits on my YouTube videos don't clue them in, I regularly remind them I won't be feeding my family with my game designs or my songwriting. In fact, half the reason I'm mediocre at most of my hobbies is because I didn't put in the work when I was younger. When I see they've got a talent for something, I encourage them to do the necessary work to be great. I also direct them to examples of professionals in the field. Just remember that overall the students love it when they see you make barely acceptable art. Who cares if the one kid tells you his grandma draws better than you? Most will find it entertaining. I finally get some compliments on my guitar playing and even my games seem like great fun in what is often an environment void of creativity. So I encourage you to take plunge this week and share something new you made, even if (or maybe even because) it is just OK. 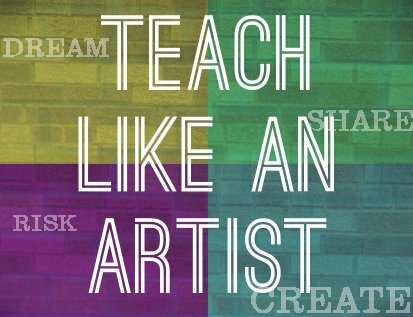 I wrote a post at the end of summer about teaching like an artist. It is what I have learned after about seven years working in education at jobs that let me express creativity and passion in school. Contrasted with about 12 years of a largely dull approach to teaching high school math, it has been an invigorating experience. I’m still living and learning it daily, but I want to share what I’ve found so far. I’m taking the broad perspective of what it means to be an artist and what counts as art. To me, the artist is someone who sees, works to make and then shares something that didn’t exist before. It might be physical or it might be an idea. But in any case, the artist is driven to bring the dream to reality. And what drives the process? Certainly many things, but primarily it is because the artist is meant to create. I have to believe people are here to make a contribution, to make their piece of the world somehow different than when they first came. To do otherwise is to slowly squeeze the life out of their existence. Instead of squeezing it out, artists are those who know how to let life shine through. Emotions, especially love for something, personality and talent, come through like light through a prism. What emerges, the art that didn’t exist before, grabs the attention of anyone who can see it. Defined this way, we can all be artists to some extent. Any sphere of society where we might find ourselves will benefit when we become aware of ourselves in this way, but this is so true of schools. There adults impact the younger generation daily. There it feels like too often the goal is to just find some answer everyone else already knew. Schools desperately need more artists! Teaching like an artist has restored my sense of purpose on the job. I feel connected to why I am here. When I talk to a group of students about the projects I will be involved with, I am amazed at the memories across forty years that flood my mind and add up to what I need to say to inspire learning. I can share stories to encourage, model skills for their success and relate to their dreams and frustrations. It feels like the moment is a gift, not something that just happened. It is refreshing to see the fruits of our contributions, whether large or small. In a largely consumer culture that requires a lot of input for fleeting moments of enjoyment (TGIF? ), the artist can draw energy from regularly creating. When people and parts of the system in your school are different in real ways because of work you have done, you’ll experience something money can’t buy. Artists enjoy sharing their work. This is related to the above point, but by this I mean sharing beyond the day to day job. Technology allows us to easily share our best work with other teachers around the world. Listen to artists talk about the reward. They often say it is in seeing others enjoy what they created. That’s the reward we can experience when we find other teachers used our lessons or got ideas from seeing what we did. Students will be inspired when you create. They will thank you for what you taught them or, perhaps more accurately, what you awakened in them. They will begin to create and discover their own ideas and they’ll be excited to tell you about them. There is excitement and anticipation when you live between your vision of what can be and what your vision becomes. This sure beats the boring approach I hear so often from tired colleagues (though I love them all) who already know the result of their hard work. Within minutes of seeing their class lists they can tell me how the grades will turn out, who the trouble students will be and which projects will fail. Of course life reflects their low expectations and their reward for being right is as uninteresting as their classes. Isn’t it more exciting to dream and see if the dream could come true? What would school be like if everyone came in wondering how things might turn out? Artists can live in the face of the negative emotions. Yes, ideas will fail, teaching will be exhausting and students will disappoint. I have struggled with deep frustration and depression throughout my career and many times I have seriously questioned if any of what I say here is worth it. It has helped greatly, however, to recognize all of that as part of living in the space between vision and reality and that I was made for that. Rest assured that in doing it right we will at times appear crazy, to others and to ourselves, as we work toward our visions. It’s not about living a life void of the negative emotions and moments of insanity. It is living in spite of them. If we won’t push through, who will? And what are we really choosing if we choose to do otherwise? In short, the teacher who lives like an artist is more alive. To be fully alive a person must recognize the blessings of life and fulfill his or her responsibilities. Artists train their eyes to see both parts. They possess the talent and have developed the skills necessary for the part they are meant to play. Teachers living like artists get to do this surrounded by young people who are starving for such an example. Note from 3-31-2014: I wrote this post at the end of summer in 2013 on my other blog. "I am an artist.... I am here to live out loud." We've probably all seen the websites and books that encourage us to teach like different things--pirates, rockstars, champions. I didn't search long and hard, but I imagine there are probably lists out there already about teaching like an artist. In one way or another, we're probably saying the same things. I like the idea of teaching like an artist, though, because it allows for passion, personality and maybe even some insanity. Artists dream and bring the dreams to life. It's fun to hang out with artists. They can straddle the line between deep insight and admiring things that just look, sound, taste or feel good for reasons they don't care to figure out. They show us another angle we wouldn't have seen on our own. Our students would have a great time hanging out with people like that day after day. To me, art is love expressed freely. It might involve a lot of other emotions too, but behind it all there is love for something. Art is something powerful + you, the artist. And what comes out is unique. Artists know how to capitalize on that uniqueness and make the world a better, more beautiful place because of their work. Almost everyone falls in love with another person. We go through the stages like most people and similar events happen in all the stories. But artists put those things in words, songs, pictures or other creative works in ways that inspire, connect and encourage those who experience the art. Artists remind us we're not alone, that there's something worth getting out of bed for and that at times life will demand everything you can possibly give. School needs more of these people! 1) Think of a new way. Make a habit of putting a new spin on something you always do. Give it a new name, retype the version you've used for a decade or use some other tool to present it. Don't change it for change sake, but make it your own. Artists let personality and talent shine through what they do, but when we have kids showing up at the door every morning we forget to let that happen. Purposely put your touch--some twist no one else you know would come up with--on something new each week. If you can sing a little, sing more. Draw? Draw more. Write poems. It will be worth the extra couple hours on a weekend. This might be the best way to stay inspired and inspire others. It is certainly easier than ever to share your best work now, yet I'm continually amazed at how few teachers do so. Artists know it is rewarding to see how far their ideas go. Whether it's a blog, website or Pinterest, start an account and start sharing. The joy of finding that someone else, possibly on the other side of the planet, used your work with her students will add significance to your hard work. 3) Notice what you love and love it out loud. Students need to see more adults who are passionate about something. I go from class to class in my district working with many teachers and too often the only real life examples I hear are related to jobs and making money. Too often it's in the language of the mass market and commercials. No wonder the kids are bored. Life is filled with exciting opportunities to learn, grow personally, meet deep needs and leave a mark. There are reasons to be so grateful you can't help but tell about it. Do your students know what you're passionate about and thankful for? Do they know why you decided to be a teacher? Are these things expressed in ways that only you can? This isn't necessarily to make them love those things too, but it can show them what passion and joy for living look like. 4) Let yourself feel and express the negative emotions too. Let's face it, artists can be troubled people. We know the stories, but chances are if you've made any serious attempt to be an artist of some sort you've felt it yourself. It is frustrating to care so much and have your hopes dashed. It might have some benefits to always see what others don't notice, but sometimes it can feel like you're the only one one the planet dealing with reality. The heart that makes great art is also more sensitive to the pain of real life, so expect it to hurt. Just keep doing the work because the only alternative is to stop really living. Seth Godin convinced me of the importance of this in The Icarus Deception. In fact, he said if there isn't risk, it isn't art. As with #4 above, fear of failure will always come along if you're working like an artist. Expect it and live with it. The best teachers I know are the ones who give everything knowing very well it won't always work. They might look stupid for a few minutes when the new technology isn't coming through. They might waste hours planning a lesson that is ruined by a snowday and some students in rotten moods. They might have to reteach another lesson because the video they made didn't really do the trick. This isn't a suggestion to be completely stupid. Know the cost and proceed like a professional who does have bills to pay. It won't hurt to loosen up though. Face the fear of failure and press on. You'll learn some of your best lessons when you realize you survived the awkward moments. 6) Tell the story in your way. I know you'll be busy if you're teaching like an artist, but be sure pay attention to what's going on. Tell that story. First of all, tell it to yourself in a journal. Record what you're learning. I don't care if it's a sticky note or an email to yourself, don't let the moments slip by. Keep track of them and polish them later if you find a reason to show them off. But definitely show some of them off. Tell the stories to colleagues and tell some to the world. This goes along with sharing your work, because the story itself is art, but by the story I also mean the big picture. It's not just about the art you made, but it's how it was accepted. What did the students learn? What did you learn? What did you notice that everyone else should pay attention to? Obviously you could write these things in a blog or maybe you'd even write a book over the summer. It's all easier than ever. But don't limit it to written narratives of what happened. You could also write a poem, a song or a video (or a video with your poem turned into a song) inspired by what you learned. Find a creative way to present it. Call it an example for a student project or show it off at parent night. Just keep reminding everyone that it's worth doing the work. Note: I already mentioned Seth Godin's book The Icarus Deception I also want to point out that his book Poke the Box had a huge impact on me. Steal Like an Artist by Austin Kleon also influenced how I view my work, which in turn inspired much of this article. All the books are pretty quick reads, so check them out at a library or buy a used copy on Amazon.